Federal Law Enforcement 9mm Luger Ammo 124 Grain Hydra-Shok Jacketed Hollow Point ammo for sale online at cheap discount prices with free shipping available on bulk 9mm Luger ammunition only at our online store TargetSportsUSA.com. Target Sports USA carries the entire line of Federal Law Enforcement ammunition for sale online with free shipping on bulk ammo including this Federal Law Enforcement 9mm Luger Ammo 124 Grain Hydra-Shok Jacketed Hollow Point. Federal Law Enforcement 9mm Luger Ammo 124 Grain Hydra-Shok Jacketed Hollow Point review offers the following information; For nearly a century Federal Ammunition has put its focus on manufacturing quality products with cutting edge technology. This dedication to excellence has given Federal a competitive edge as an ammunition technology giant. Today the company is well known for producing high grade centerfire, rimfire, and shotshell ammunition that shooters everywhere know and trust. Federal Premium handgun loads are the best around! Federal Premium Law Enforcement ammunition is an excellent choice for law enforcement agencies as well as concealed carry permit holders. Protect your home and family with a time-tested and popular ammunition choice among defense experts. This Federal Law Enforcement 9mm Luger ammunition is loaded with a 124 grain Hydra-Shok Jacketed Hollow Point bullet. The unique center-post design of the Hydra-Shok Jacketed Hollow Point delivers controlled expansion while the notched jacket provides efficient energy transfer for maximum penetration while retaining stopping power. These personal defense loads by Federal Law Enforcement feature increased muzzle velocity and energy compared to standard loads, the penetration and stopping power of Premium bullets and reduced recoil. Federal Law Enforcement is non-corrosive, new production ammunition in boxer primer and reloadable brass cases. 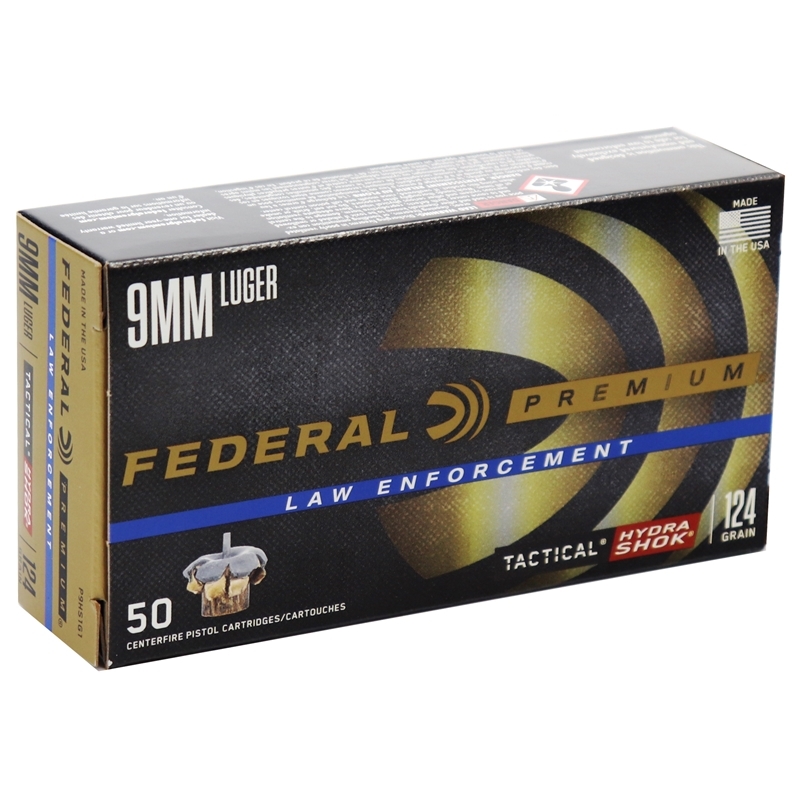 Federal Law Enforcement 9mm Luger is packaged in boxes of 50 rounds or cases of 1000 rounds. Purchase a case of Federal Law Enforcement 9mm Luger bulk ammo from Target Sports USA and receive free shipping! Good Federal Law Enforcement 9mm bulk ammo, cheap and free shipping. I really like the accuracy of these Federal Law Enforcement 9mm Luger Ammo rounds. Consistent. No issues whatsoever with Federal Law Enforcement 9mm Luger Ammo. Have not shot any yet, but the service from TSUSA was good. They shipped free and fast.